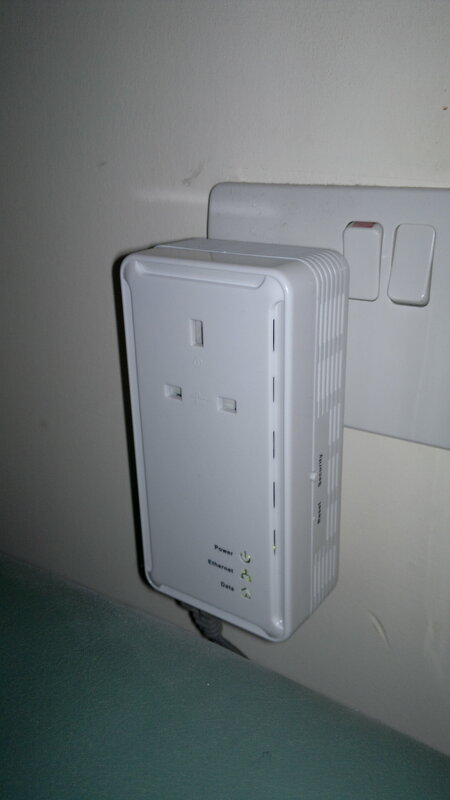 Earlier this week, we took delivery of a pair of NewLink HomePlugAV (200Mbps) powerline Ethernet adapters, to replace the older HomePlug “Turbo” (85Mbps) pair which had faithfully sent the Internet upstairs to our computer room since 2006. They were still working as well as ever, but were beginning to struggle with the demands we were putting on them, so we decided to buy a pair of HomePlugAV adapters to boost the speed we get on the Mac upstairs. OK, that was the theory. When I plugged everything in and tried playing back a 720p HD video from our home server (an acid test if ever there was one), it “sort of” worked, in that it played at all—the old 85Mbps adapters would’ve choked completely on a file that size. However, there were still quite a few pauses, and I found myself thinking: isn’t HomePlugAV designed for handling traffic like HD video? True, the link was faster than the old setup, but not by much at all. What was going on? Worse was to come. I’d kept the old 85Mbps adapters for use with another PC in a different room (sort of an “overflow” machine, in case the Mac was in use). Later in the evening, I found that on the Mac, the HomePlugAV link had slowed to a crawl—worse than even the 85s managed. Either I’d made a bad purchasing decision, or something screwy was happening between the HomePlugs. Bearing in mind that HomePlugAV adapters tout a “200Mbps” figure (although every review will tell you that with interference in electrical wiring, etc., 150Mbps is probably the most you’ll get), the initial results were very disappointing. To cut a long story short, I did some digging, and learned that according to a SmallNetBuilder article on boosting HomePlug speed, it is a bad idea to mix 85Mbps and 200Mbps HomePlugs on the same electrical system, as the 85s appear to cut the throughput of the 200s by as much as half. Further iperf tests confirmed that the 85s do appear to affect the 200s on our network (though not by as much as the article suggests), so I plan to replace the 85s with 200s as soon as my budget allows. Nearly an hour of unplugging, swapping and trial/error in our computer room later (and there were plenty of sockets to try up there), iperf informed me I had only managed to nudge the top speed up to the high-20s Mbps. 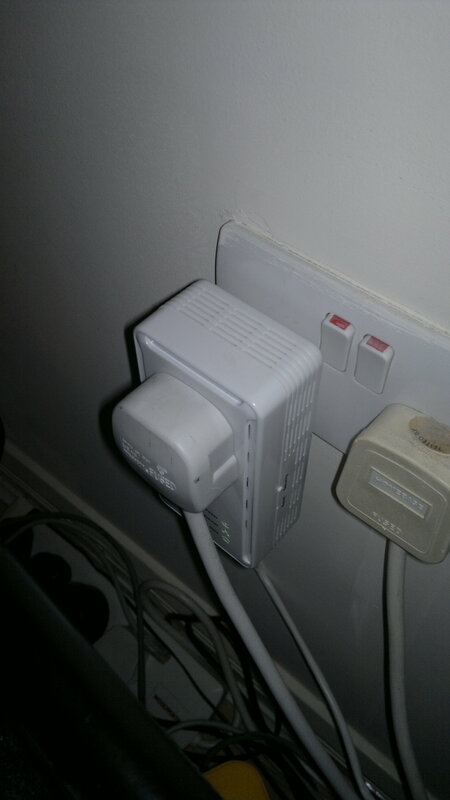 It was time to move the focus downstairs, to the other end of the HomePlugAV link: in the lounge, by the ADSL router. To set the scene: the HomePlugAV adapter was plugged into one of the two wall sockets, and the other contained a Belkin surge protector, powering a four-way “gang socket” with four devices connected (almost all “mains adapters” or “wall-warts”). I had an inking that one or more of these factors was spraying interference into the system, but I couldn’t really turn any of them off. Then it hit me: why not try moving the HomePlug to another socket, about 3-4 metres further along the wall, and run an Ethernet cable back to the router/switch? In fact, I’d already been doing that with the 85Mbps HomePlugs, so I swapped the locations of the 85 and 200 adapters, and fired up iperf once again. So, I now have a reasonably-speedy HomePlugAV link running in our house—45-50Mbps is some way short of the 150Mbps “ideal”, but it’s just about fast enough for 720p HD video, so I can live with it for the moment. I plan to get rid of the 85Mbps HomePlugs as soon as I can scrape the cash together for another pair of 200s, and then I’ll probably look and see if I can squeeze any more Mbps out of our home wiring (hopefully without needing an electrician!). 20 Mbps is fast enough for most HD video, unless you’re talking about uncompressed bluray. For example, Netflix’s highest quality 1080p stream is about 6 Mbps. SD video is 1-2 Mbps. I know it’s a couple of years old now, but some useful stuff here. Can you give any advice on tesing the speed using iperf? Are there any better solutions out there? I’m having some issues with my TP-Link 500 devices and really just wanting to get an understanding of the speeds I’m actually achieving. My hunch is that the wiring in the house is causing problems. Hi Neil – thanks for your comment. I haven’t really done any more speed-testing since I wrote that post, though I might need to soon, as at least one of the current HomePlugs I use (Trendnet 500Mbps ones) may be failing, as the throughput has plummeted. It’s often due to interference in the mains-wiring, although surge-protectors really don’t help – where you can, give a HomePlug its own socket, or at least not one in a surge-protected “strip-plug”. On the software front, I’d still use iperf myself, being a Linux/Mac user, though your mileage may vary. Are you mixing the two speeds of Homeplug? If you are, they will default to the lowest speed standard across the network (i.e. the 85mbps standard), and the drop in speed will be as a result of adding more plugs to the network. 85mbps Devided by the amount of plugs in use. Unplug any 85mbps plugs and retest. Thanks for your comment. I actually wrote the article five years ago, and have long since moved on from 85Mbps HomePlugs (I went on to 200Mbps, and I then used some Trendnet 500Mbps models until they both failed on me a while back (!)). However, I do recall that I was not mixing standards – I had read that 85 and 200 adapters really don’t “play nicely” with each other on the same electrical system, so I deliberately didn’t make them coexist. Good thought, though, and thanks again for sharing!